As a nation, we’re overly obsessed with the weather. We so well converse in it, we use it to fill any awkward silences that occur in all social situations. In order to prepare for such detailed and analytical conversations, we will often summarise any slight change in weather conditions on a daily basis. In the summer, we love to comment how inconsiderately hot the sun is. In the winter, we like nothing better than the sense of hyperbole the tiniest flakes of snow can cause. If we had to summarise the British weather in one word? Dreary. Because it’s mainly wet, overcast or bitterly cold. It’s fair to say that some places in the UK have it worse than others, meaning that some cities are more likely to benefit from our range of flood kits. We analysed typical dreary weather conditions in cities across England, Scotland, Wales and Northern Ireland. But who are the worst offenders? If you’re heading to Cardiff anytime soon, you’d best take a brolly. With the average annual rainfall sitting at 1151.9mm it’s officially the UK’s wettest city. That may not come as a surprise to the residents of Cardiff, as they are well-versed in dealing with flash flooding and overflowing River Taff. Data shows that the use of submersible drainage pumps are probably a common occurrence in Wales, as St David’s is the second wettest city. Glasgow secured the title of third wettest city in the UK with average rainfall reaching 1124.3mm. When the sun doesn’t surface from behind the clouds you’re forced to embrace the grey and say hello to the overcast it’s many shades of dull, dull, and dull. When faced with this particular weather condition, Brits often comment, ‘at least it’s not raining…’ However, there’s no denying that dreary conditions such as these are downright miserable. So, what is the greyest city in the UK? Well, that would be Glasgow. With an average of 1203.1 hours of sunshine each year, Glasgow is the most likely to be overcast. Second place goes to another Scottish city, Inverness followed by Armagh in Northern Ireland. 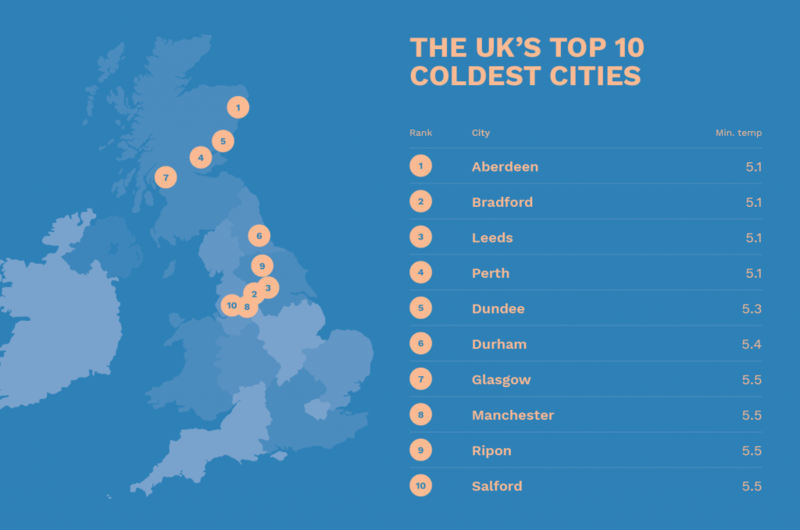 It probably won’t come as a surprise that the coldest cities are all based in the north of the UK. Aberdeen, Bradford, Leeds and Perth all have an average minimum temperature of 5.1 degrees, which is likely to cause havoc with their water pipes. That means that it’s a four-way tie for the title of the coldest city! Cities in Northern Ireland, Wales and south of Manchester seemed to escape the most bitter of weather conditions. Whilst it’s common to talk about dreary weather conditions, we wanted to look on the bright side of things...shed some light on those cities who get the best of the British weather. 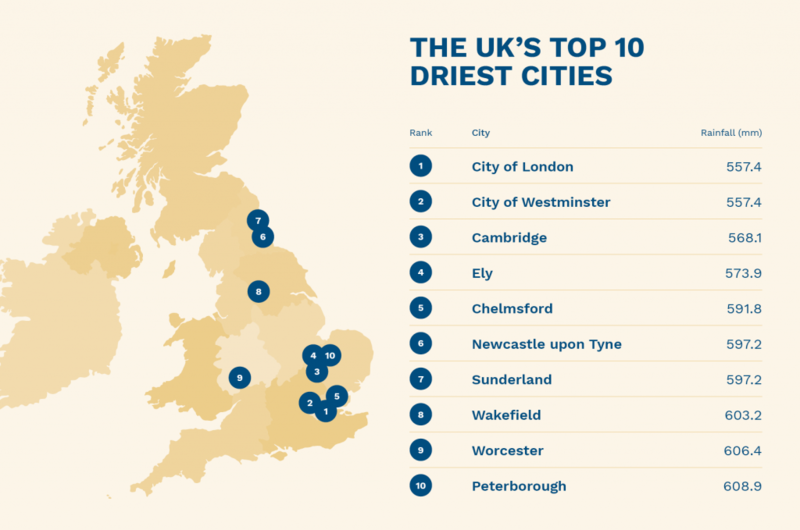 Well, it seems that Londoners escape most of the UK’s rainfall, with the City of London and the City of Westminster taking first and second place for the driest UK cities. Those in Cambridge also get minimal use of their umbrellas, as the city took third place. Notably, many of the cities in the top ten are situated towards the south, however, Newcastle upon Tyne and Sunderland break with the trend. 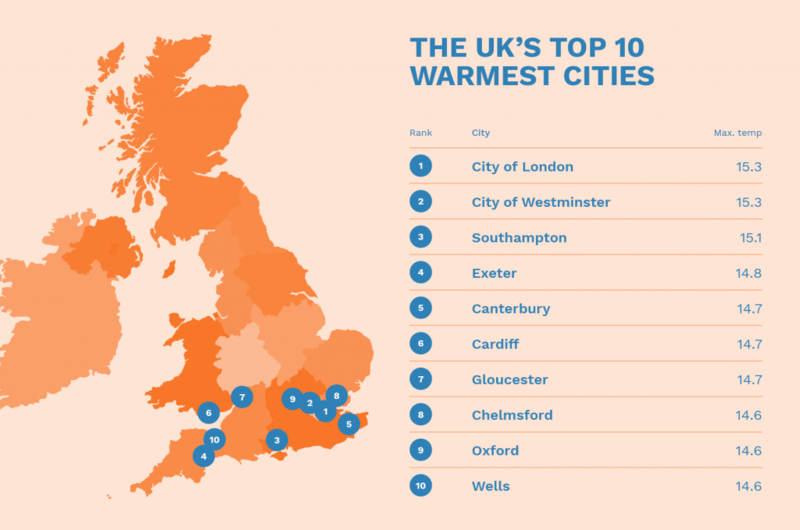 With an average maximum temperature of 15.3 degrees, the City of London and the City of Westminster are the warmest cities in the UK. They’re closely followed by Southampton and Exeter. Every single city in the top ten is located in the south. So, it’s true what they say- it’s colder up north! 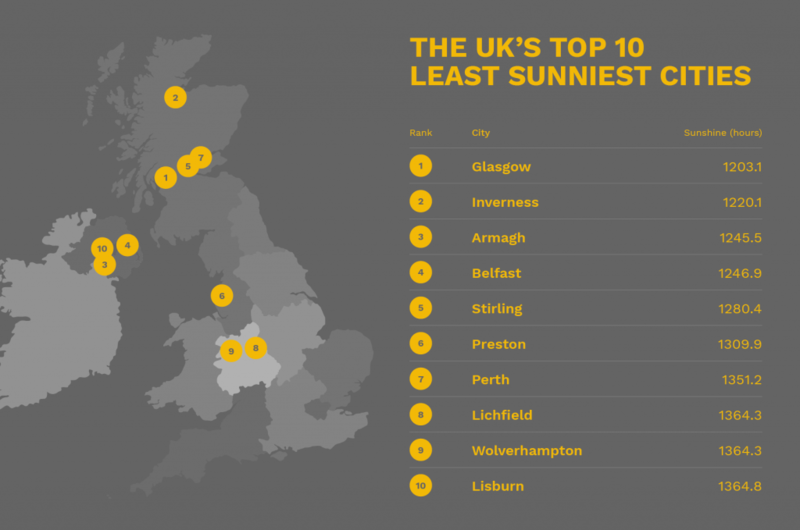 So, where does the sunshine the most in the UK? 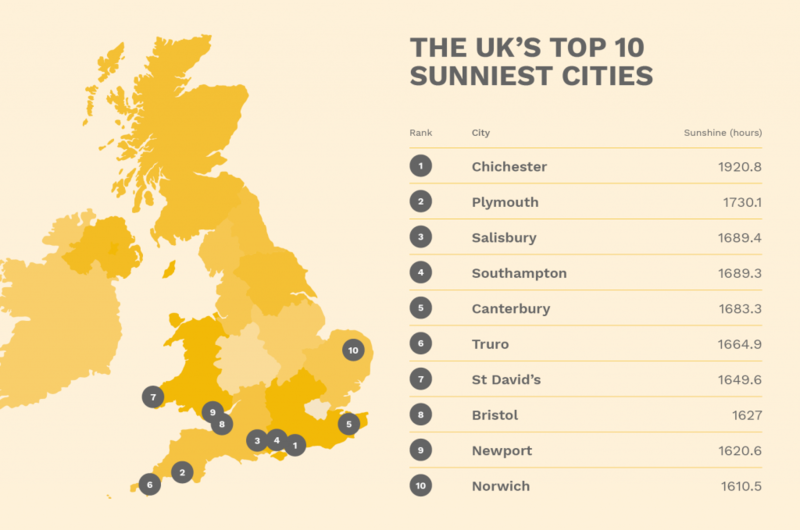 If you head to the city of Chichester, that’s where you’re likely to enjoy the most sunshine. Chichester basks in an average of 1920.8 hours of sunshine a year, so if you’re ever visiting you might need your shades. Plymouth features second in the top ten sunniest cities list, enjoying 1730.1 hours of sunshine. Salisbury took third place with 1689.4 hours of sunshine. Remember, if you are living in an area that suffers from higher than average rainfall, it may be worth checking out our range of flood kits which can help you to protect your home or business. You can never be over-prepared when it comes to the unpredictable British weather. The data featured in this article is based on the most recent Met office statistics which details the average measurements for various weather conditions and indicators. Data from the Met office includes, but is not limited to average maximum temperature, minimum temperature, sunshine hours and rainfall.